PNNL researchers have developed a hybrid anode made of graphite and lithium that could quadruple the lifespan of lithium-sulfur batteries. 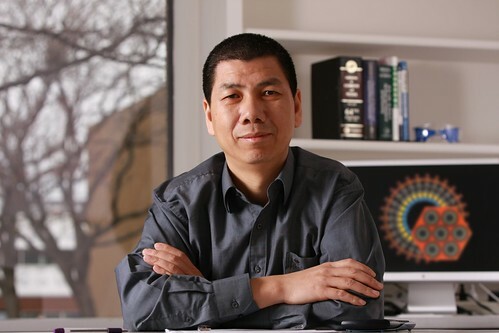 PNNL Laboratory Fellow Jun Liu is the corresponding author on a Nature Communications paper that describes a new anode made of graphite and lithium that could quadruple the lifespan of lithium-sulfur batteries. RICHLAND, Wash. — It's known that electric vehicles could travel longer distances before needing to charge and more renewable energy could be saved for a rainy day if lithium-sulfur batteries can just overcome a few technical hurdles. Now, a novel design for a critical part of the battery has been shown to significantly extend the technology's lifespan, bringing it closer to commercial use. A "hybrid" anode developed at the Department of Energy's Pacific Northwest National Laboratory could quadruple the life of lithium-sulfur batteries. Nature Communications published a paper today describing the anode's design and performance. Today's electric vehicles are commonly powered by rechargeable lithium-ion batteries, which are also being used to store renewable energy. But the chemistry of lithium-ion batteries limits how much energy they can store. One promising solution is the lithium-sulfur battery, which can hold as much as four times more energy per mass than lithium-ion batteries. This would enable electric vehicles to drive longer on a single charge and help store more renewable energy. The down side of lithium-sulfur batteries, however, is they have a much shorter lifespan because they can't be charged as many times as lithium-ion batteries. Most batteries have two electrodes: one is positively charged and called a cathode, while the second is negative and called an anode. Electricity is generated when electrons flow through a wire that connects the two. Meanwhile, charged molecules called ions shuffle from one electrode to the other through another path: the electrolyte solution in which the electrodes sit. The lithium-sulfur battery's main obstacles are unwanted side reactions that cut the battery's life short. The undesirable action starts on the battery's sulfur-containing cathode, which slowly disintegrates and forms molecules called polysulfides that dissolve into the battery's electrolyte liquid. The dissolved sulfur eventually develops into a thin film called the solid-state electrolyte interface layer. The film forms on the surface of the lithium-containing anode, growing until the battery is inoperable. Most lithium-sulfur battery research to date has centered on stopping sulfur leakage from the cathode. But PNNL researchers determined stopping that leakage can be particularly challenging. Besides, recent research has shown a battery with a dissolved cathode can still work. So the PNNL team focused on the battery's other side by adding a protective shield to the anode. The new shield is made of graphite, a thin matrix of connected carbon molecules that is already used in lithium-ion battery anodes. In a lithium-sulfur battery, PNNL's graphite shield moves the sulfur side reactions away from the anode's lithium surface, preventing it from growing the debilitating interference layer. 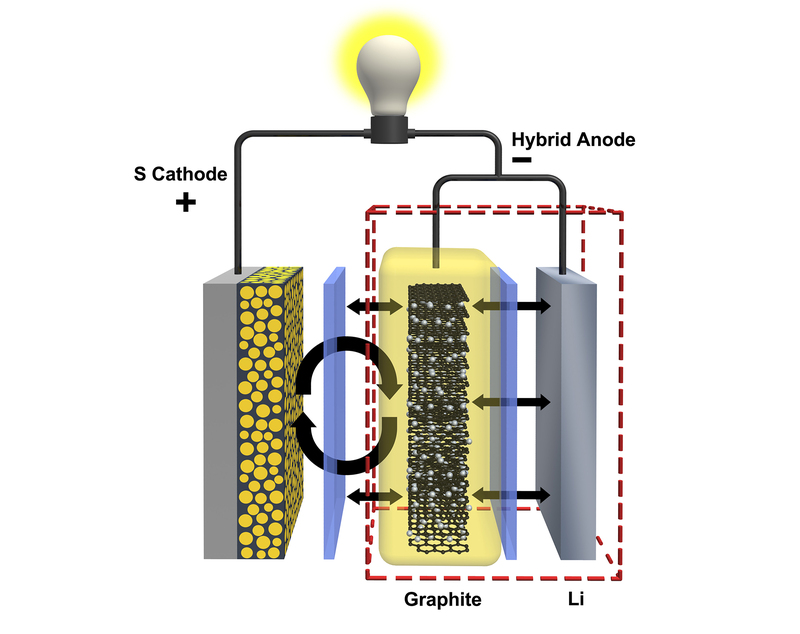 Combining graphite from lithium-ion batteries with lithium from conventional lithium-sulfur batteries, the researchers dubbed their new anode a hybrid of the two. The new anode quadrupled the lifespan of the lithium-sulfur battery system the PNNL team tested. When equipped with a conventional anode, the battery stopped working after about 100 charge-and-discharge cycles. But the system worked well past 400 cycles when it used PNNL's hybrid anode and was tested under the same conditions. This and most other lithium-sulfur battery research is conducted with small, thin-film versions of the battery that are ideal for lab tests. Larger, thicker batteries would be needed to power electric cars and store renewable energy. Liu noted tests with a larger battery system would better evaluate the performance of PNNL's new hybrid anode for real-world applications. This study was primarily supported by the Department of Energy's Office of Science (BES), with additional support from DOE's Advanced Research Projects Agency-Energy, and DOE's Office of Energy Efficiency and Renewable Energy. Some of this research was performed at EMSL, DOE's Environmental and Molecular Sciences Laboratory at PNNL. Reference: Cheng Huang, Jie Xiao, Yuyan Shao, Jianming Zheng, Wendy D. Bennett, Dongping Lu, Saraf V. Laxmikant, Mark Engelhard, Liwen Ji, Jiguang Zhang, Xiaolin Li, Gordon L. Graff & Jun Liu, Manipulating surface reactions in lithium-sulfur batteries using hybrid anode structures, Nature Communications, Jan. 9, 2014, DOI: 10.1038/ncomms/4015.